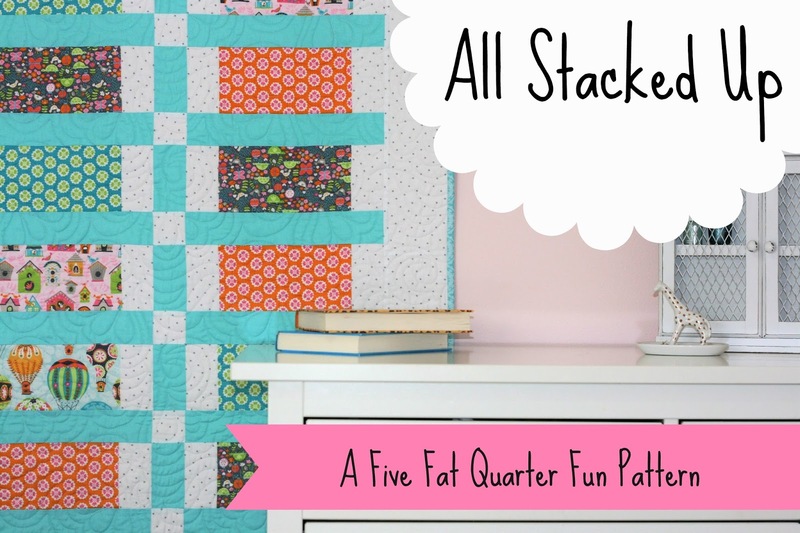 FREE Five Fat Quarter Fun pattern with you today! 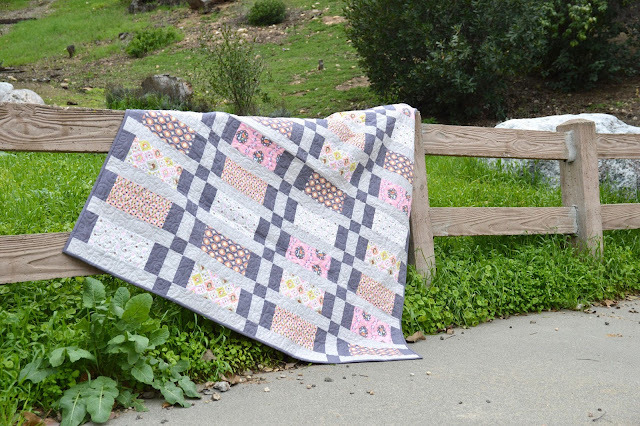 We chose to design a pattern this month that showcases large and/or directional prints. I have lots of those kinds of fabrics in my stash but can never find the right project for them because a.) I don't want to cut them up so small that you can't see the cute motifs and b). 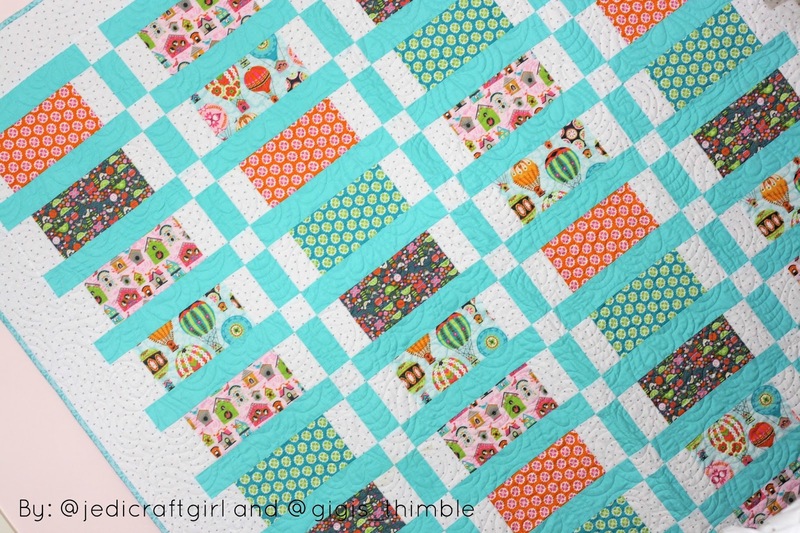 I don't want crooked/upside down ice-cream cones (or whatever the motif may be)! Thus, our new pattern - All Stacked Up. There's no funny business here. 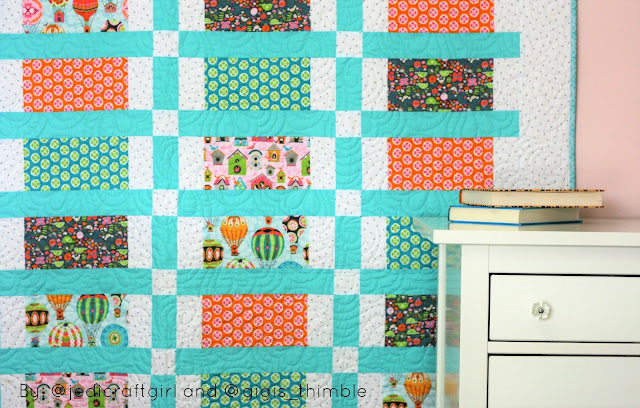 Just super simple blocks that let your darling fabrics do all the talking! 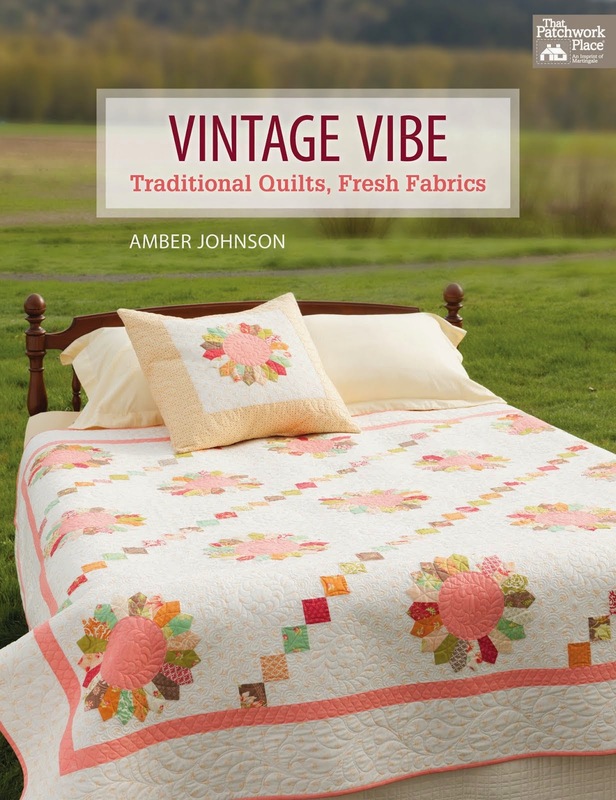 In my version, I got to work with Blend's new fabric line called Flutter and Float by Ana Davis. I love the hot air balloons and cute little houses. 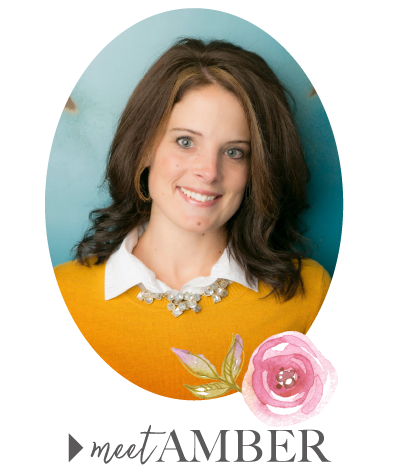 Be sure to stop by Amanda's Blog, Jedi Craft Girl to read more about her version! I love her soft colors and no border! 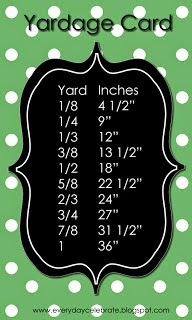 This pattern whips up really quick and finishes at 62 1/2" x 70 1/2". 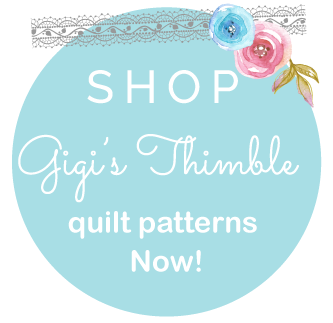 If you'd like to download this FREE pattern, click HERE for the PDF. 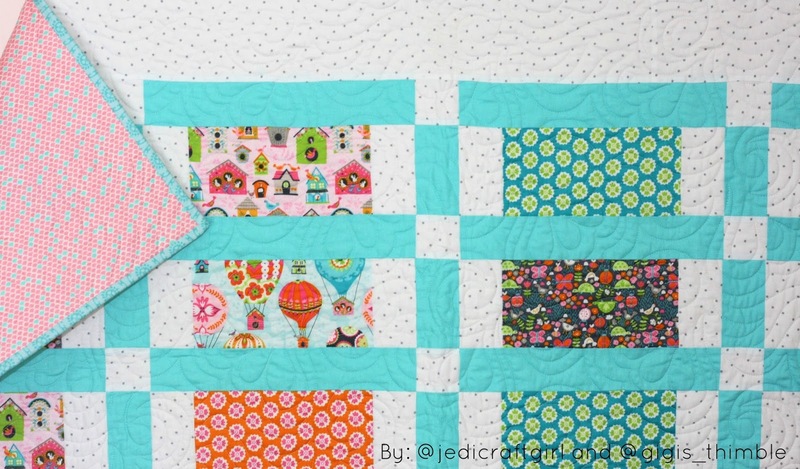 I'm having so much fun designing and making these 5 Fat Quarter Fun Quilts with Amanda. 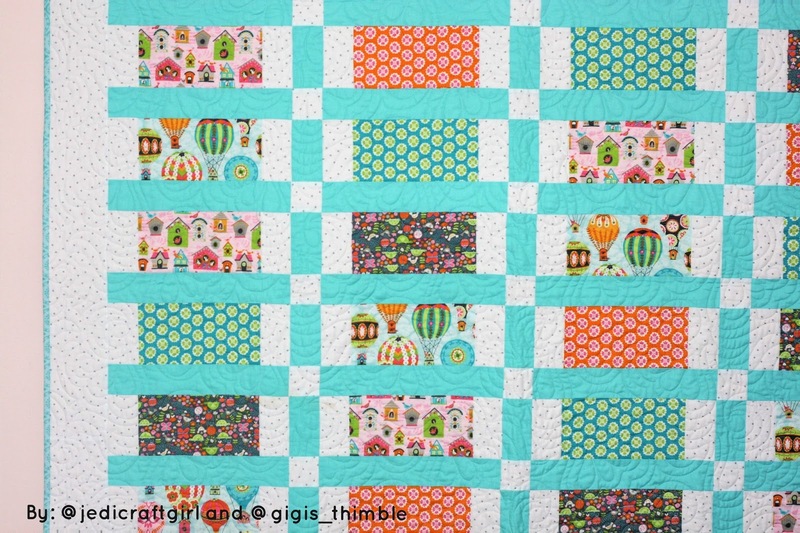 It's a challenge to make a quilt a month but I love using my stash and making patterns that I wouldn't otherwise make. If you'd like a little challenge too, come sew along with us! All the 5 Fat Quarter Fun Quilt patterns can be found HERE. If you post on Instagram be sure to tag us @gigis_thimble and @jedicraftgirl and don't forget to use the hashtags #fivefatquarterfun and #thenameofthequilt (e.g. #allstackedupquilt).